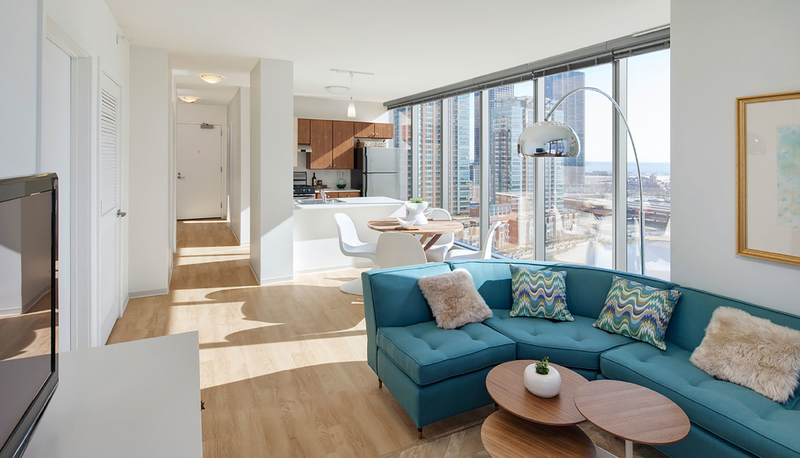 The 500-foot-tall Wolf Point West residential project rises 48 stories from the converging banks of the north, south and east branches of the Chicago River. 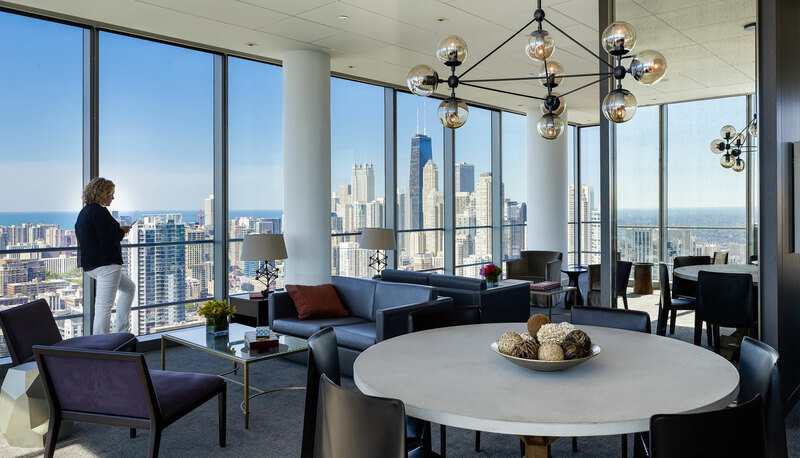 From this vantage point, residents enjoy unparalleled views of the city, river and lakefront. 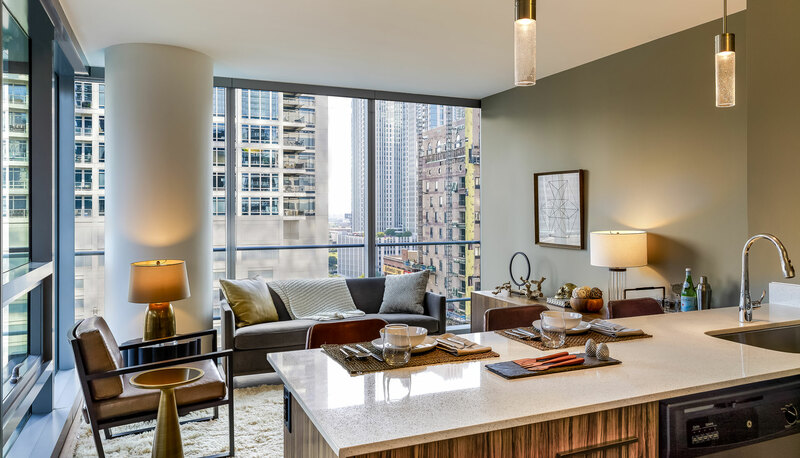 Designed with comfort in mind, the interior amenity spaces feature refined architectural detailing, sophisticated finishes inspired by reflections from the river, and tasteful furnishings appointed to convey luxurious hospitality. 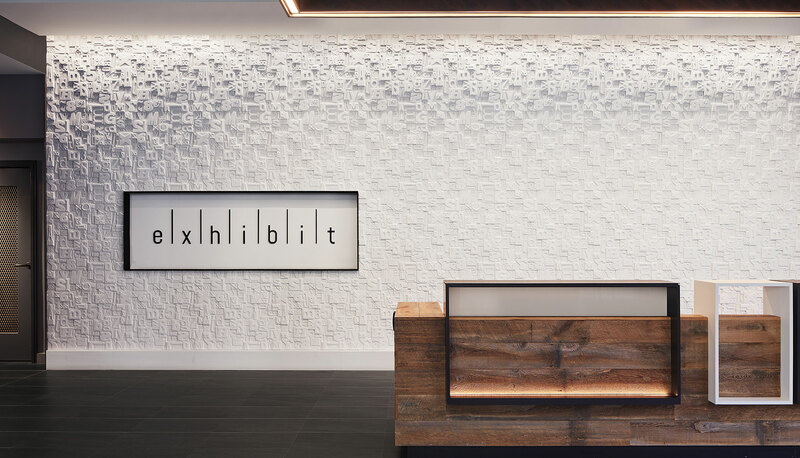 The museum-quality art collection in the tower’s entry complements its well-known location and direct access to the riverfront, city views and nightlife. 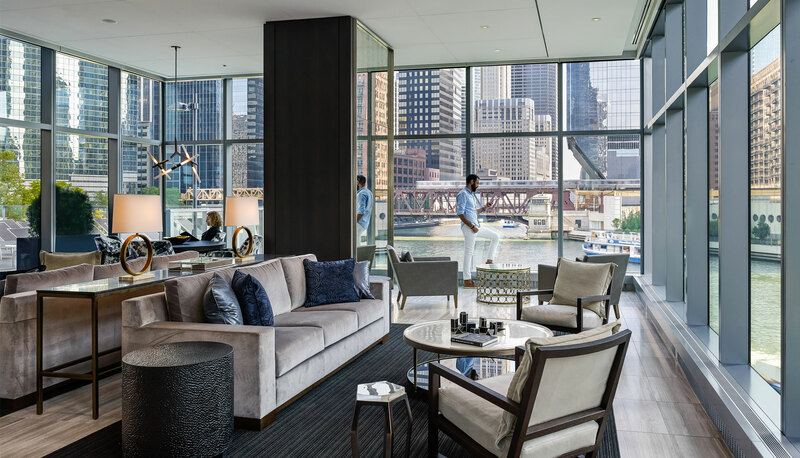 Located on the riverfront level, a riparian lounge offers spectacular 360 degree views of the river and city beyond. 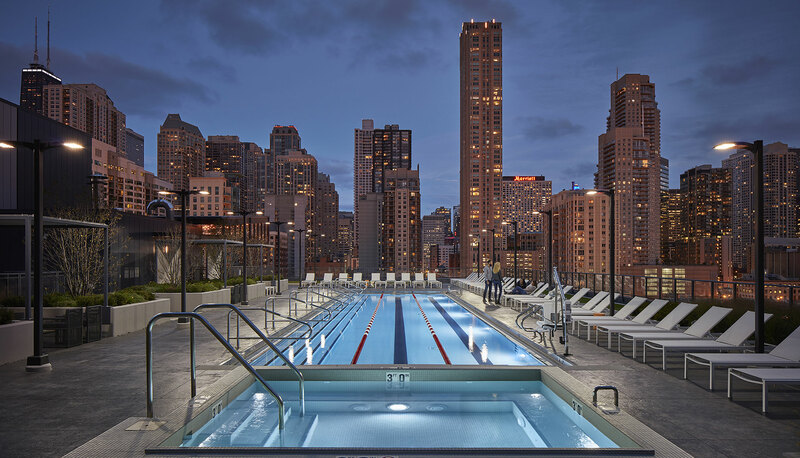 An expansive pool deck and four-acre park provide direct access to the river. 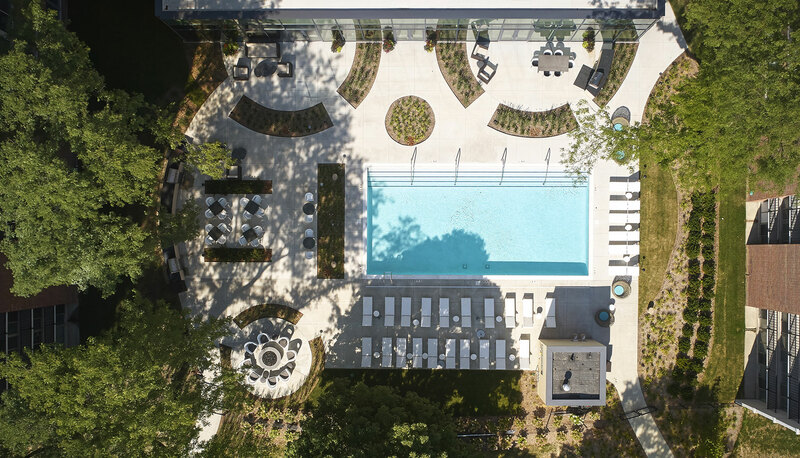 Residents can enjoy the pool and sundeck located along the waterfront or enjoy a stroll along the newest portion of the river walk. 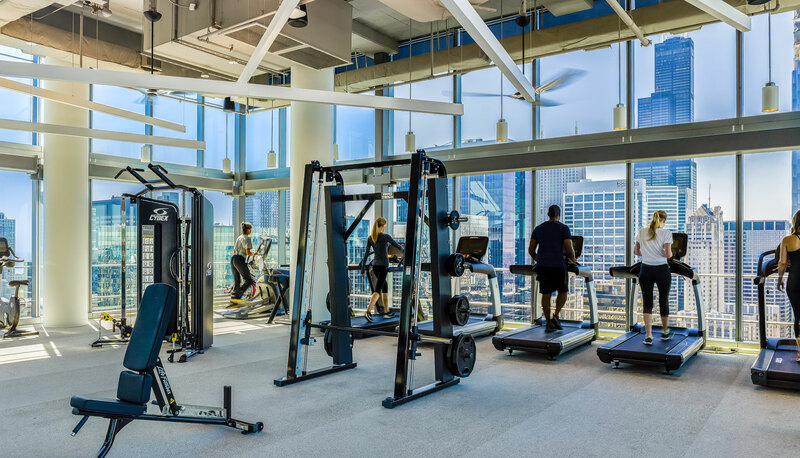 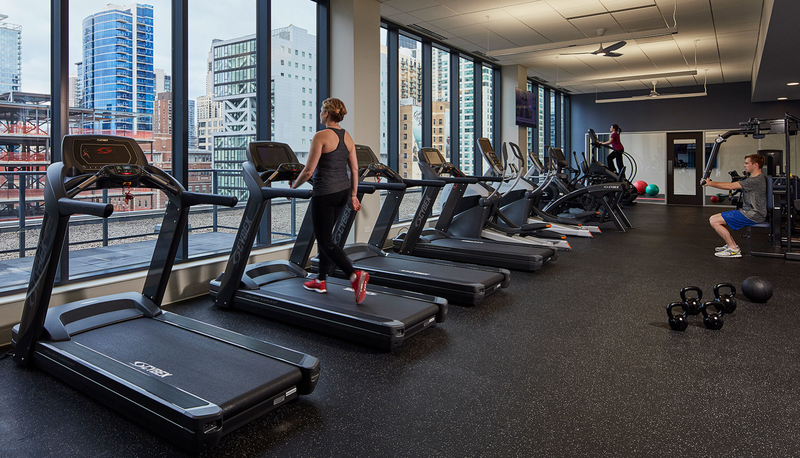 On the rooftop, a deck and double-height Fitness Center offer opportunities for relaxing and working out; the upscale Sky Lounge provides flawless service and comfort. 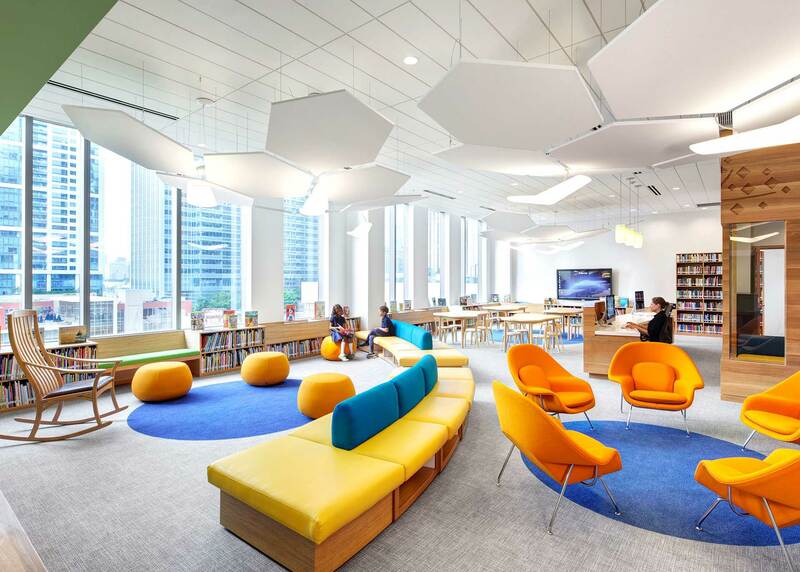 All three feature spectacular views. 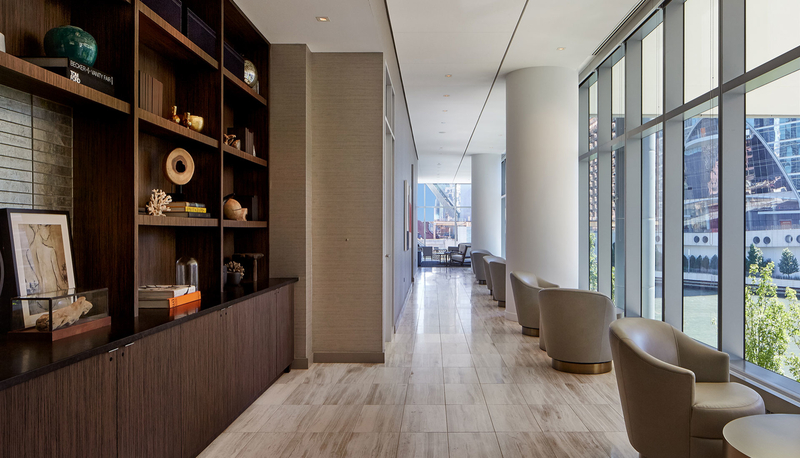 Resident services include a state-of-the art business center with views of the riverfront, a mailroom, and a dry cleaning and package receiving room. 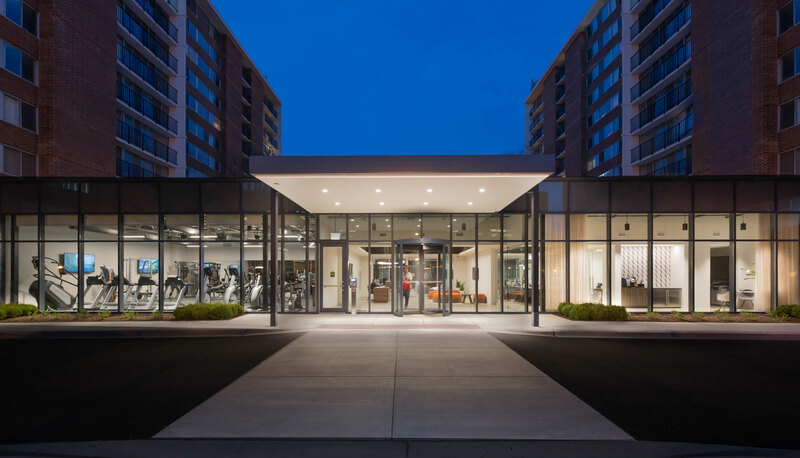 Additional resident amenities include a private pet owner’s lounge, bike wash and golf simulator room. 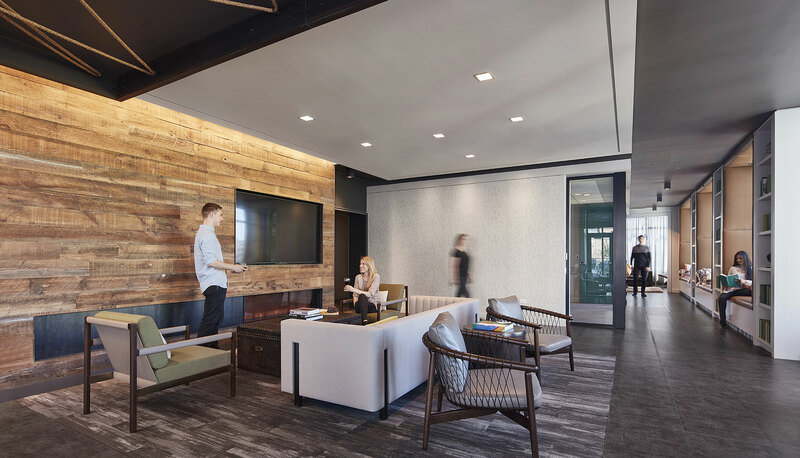 Catering to the creative professional, the edgy interior of this residential building creatively uses a concept of “smart-living” throughout the entire tower. 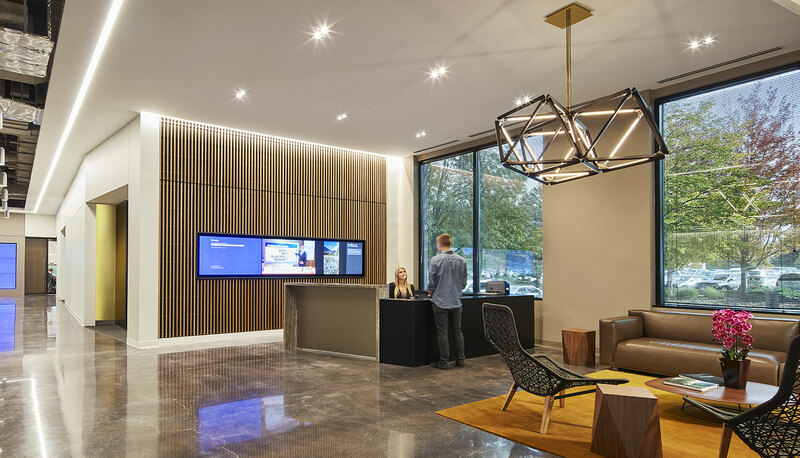 The artistic, textured residential lobby entrance provides an open communication between the building’s indoor and outdoor presence. 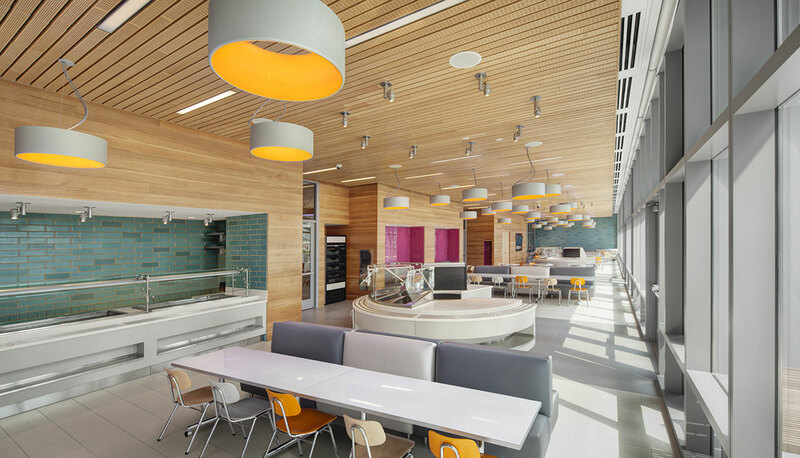 Outside, a park features extensive landscaping and a dog run that is accessible to the public. 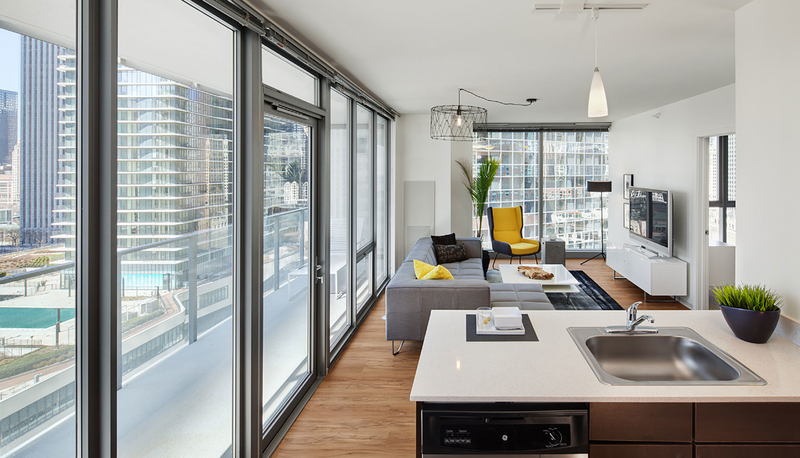 As the building features microunits, the 5th level amenity floor serves as an extended living space for residents. 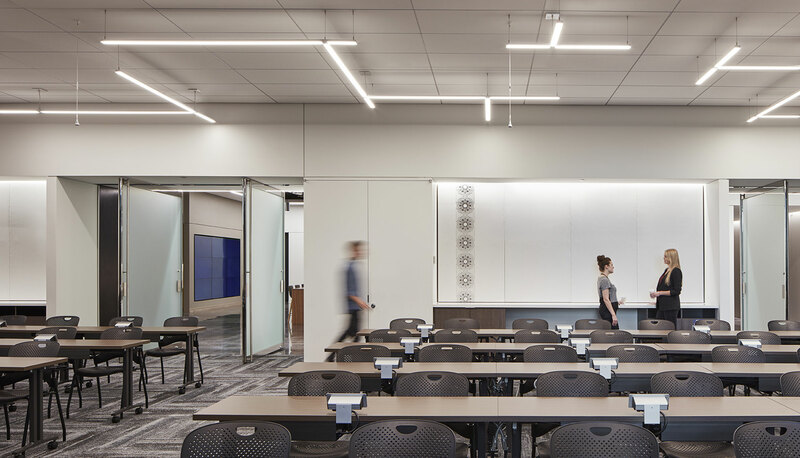 bKL designed multiple spatial uses to accommodate a variety of purposes, providing users the opportunity to reserve private work rooms for study spaces, event gatherings, as well as dining spaces. 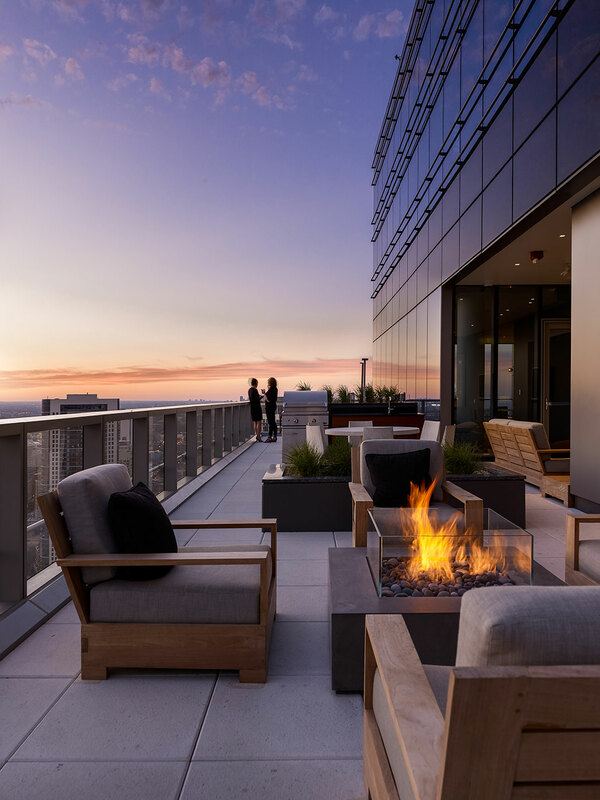 Additional amenities include a spa, sauna, fitness center, arcade games, quiet library zone, and lounge that all have direct access to the landscaped podium roof deck and outdoor lap pool. 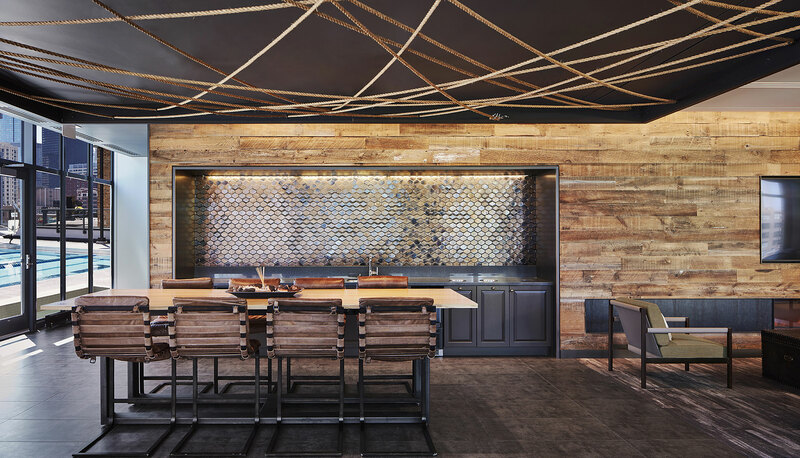 Icon Modern blackened steel panels and trim, Stone Source reclaimed wood paneling, Bendheim art glass panels, Star Moulding custom and antique decorative frames, Icon Modern custom woven rope ceiling, and Abnormals Anonymous /Holly Hunt: Trove specialty wallcoverings. 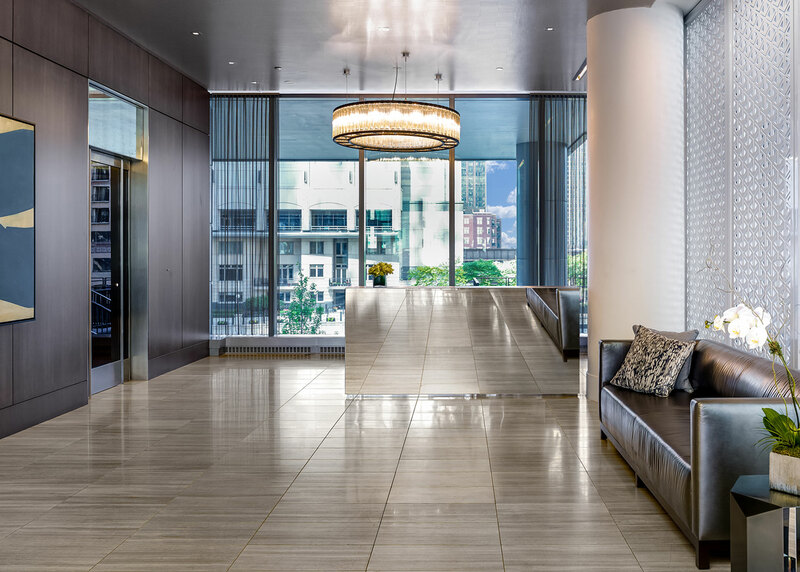 Restoration Hardware, Geiger International, Bright Furniture, Andreu World and various furniture and furnishing manufacturers. 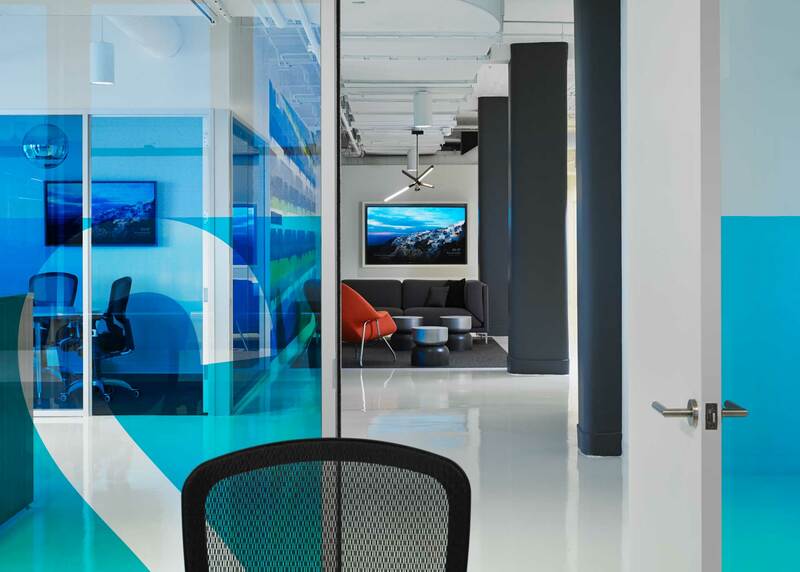 This confidential technology company engaged bKL Architecture to re-envision their Customer Experience / Training Center and their Sales, Marketing and Support Staff offices in Chicago, Illinois. 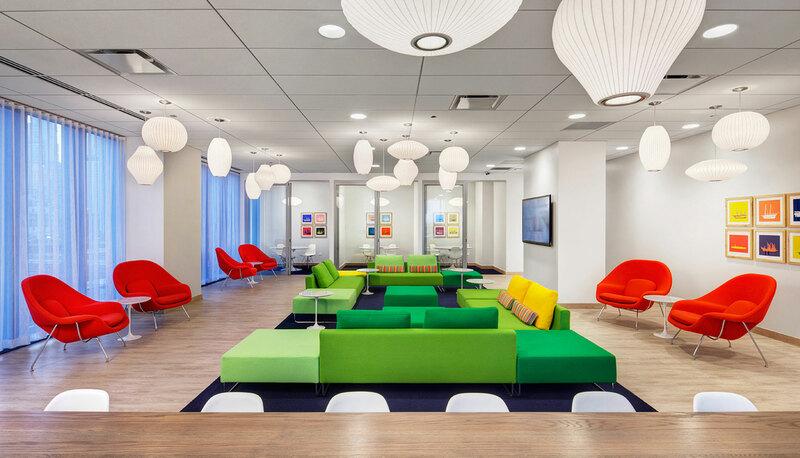 The client sought to create a rich “client centric” environment where customers, guests and employees can engage their products and services in a manner that encourages curiosity and the human spirit. 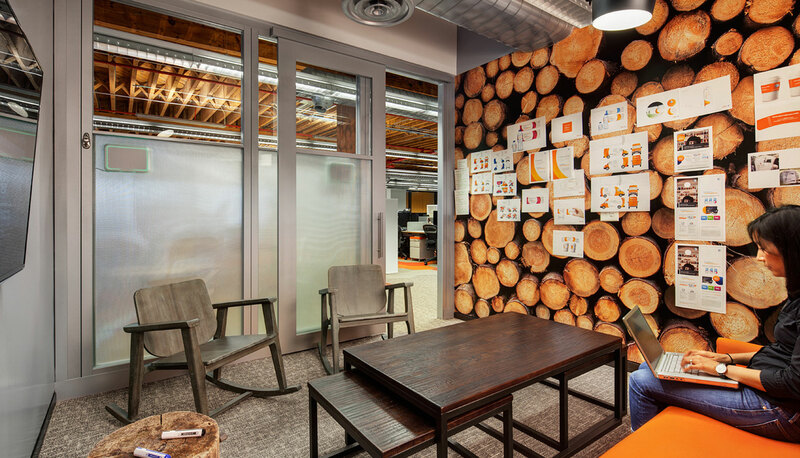 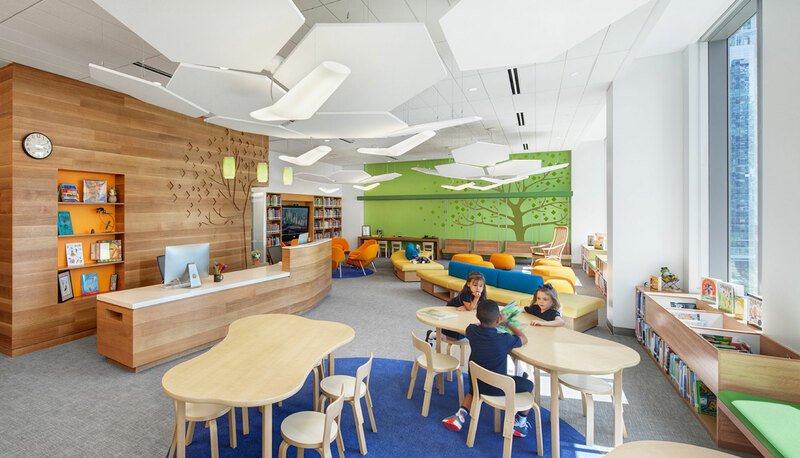 The design team set out to create a space that fosters the client’s journey of discovery. 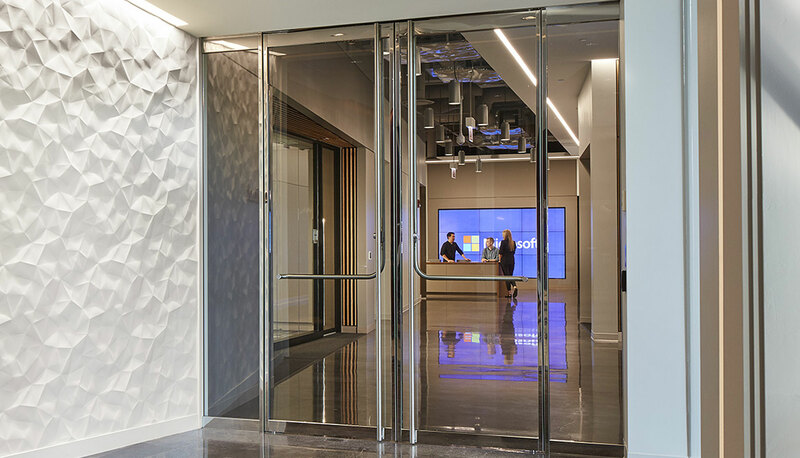 Layered architectural gestures, lighting and material applications create visual vistas that feature key points where guests may interact with technology. 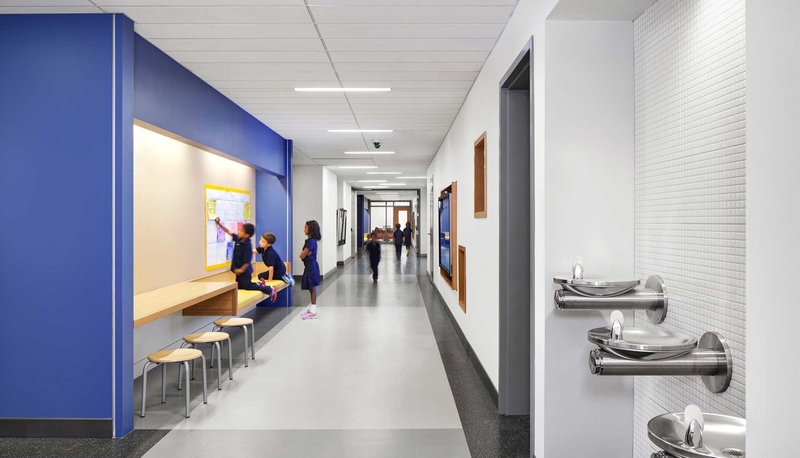 Vistas provide glimpses of key focal elements and views to the outside, encouraging movement throughout the space. 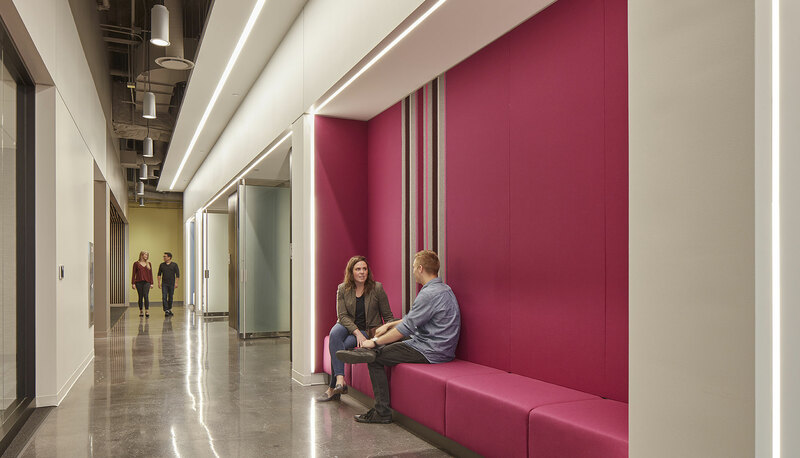 Highly textural materials, upholsteries and unique lighting applications create a casual and approachable environment. 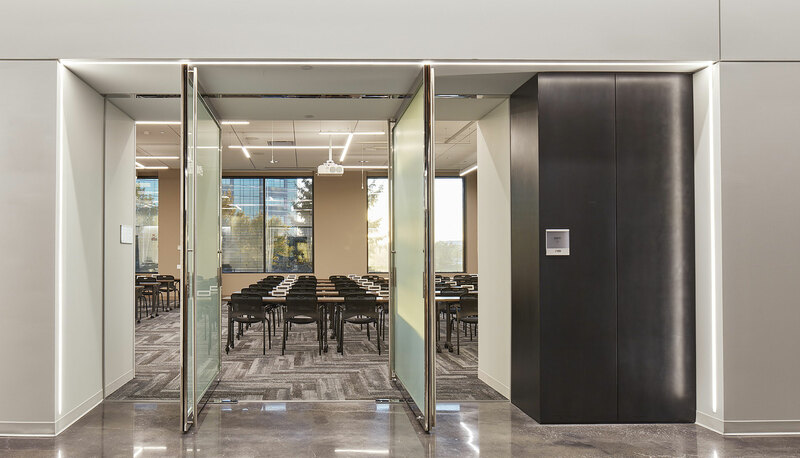 The customer space includes a divisible multi-purpose room, large, medium and small conference rooms and a large open lounge area that promotes casual interactions between formal meetings. 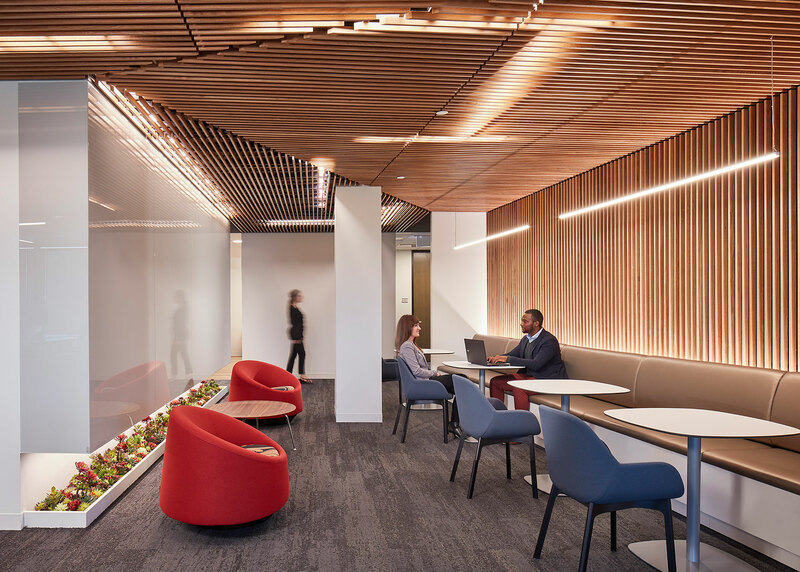 The employee space located on an adjacent floor encourages employees to find a work point that suits their varied work styles while providing support services in convenient and accessible locations that promote productivity and employee satisfaction. 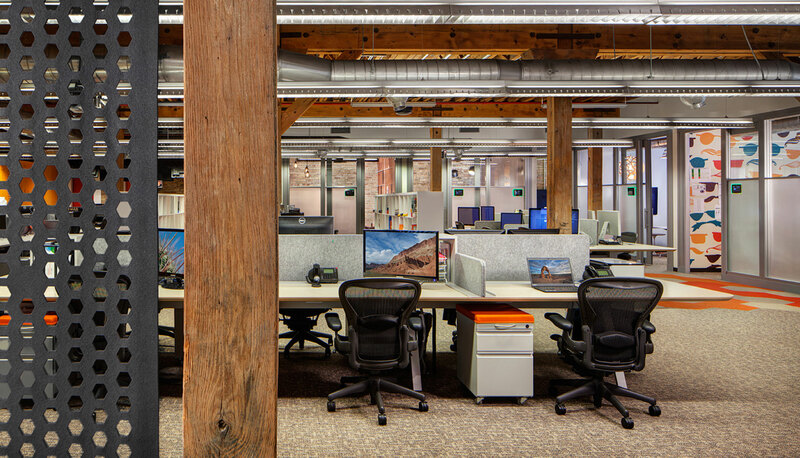 The result is a unique experience rich with opportunities that encourage curiosity and creativity where customers and employees are empowered to explore and challenge their notions about the future of this company. 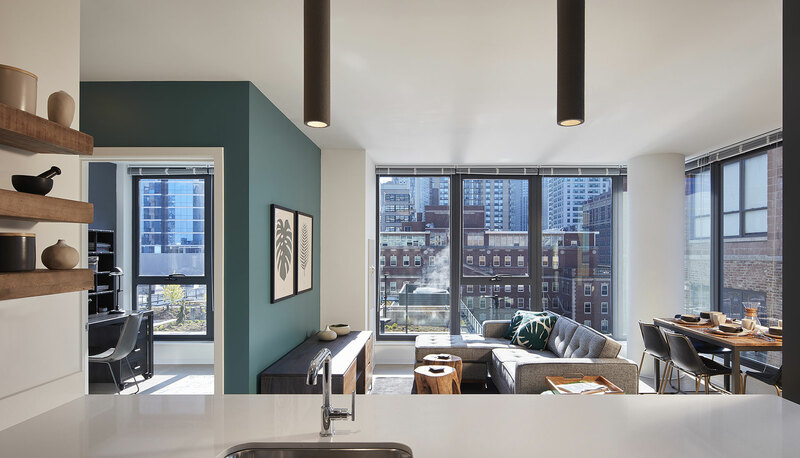 bKL provided interior architectural services for The Gallery on Wells, a new residential tower located in Chicago’s River North neighborhood. 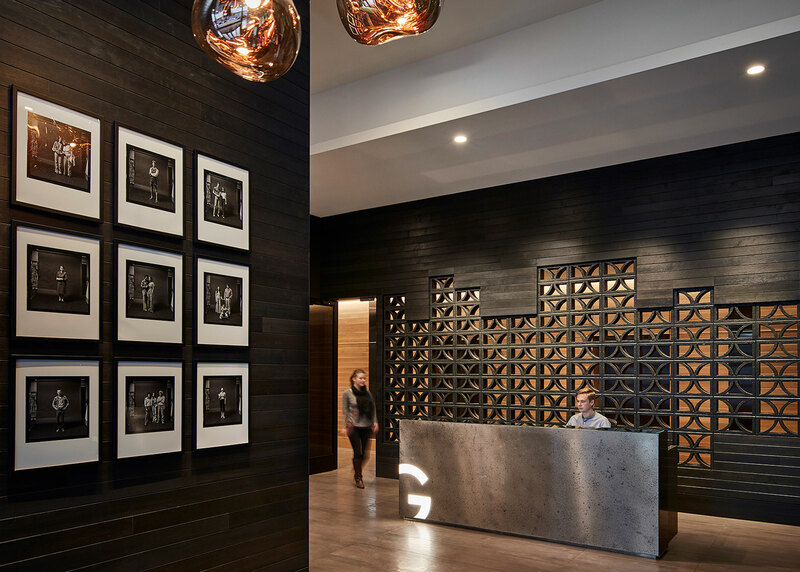 Residents are welcomed to a depth of layering upon entering the dark and textured lobby. 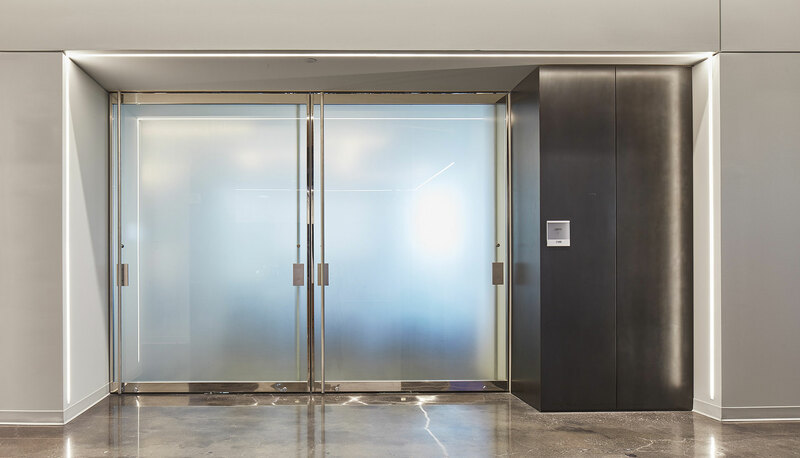 An element of surprise is introduced as one moves through the entry, as a featured wall of black concrete blocks and stained wood slats unveil a bright elevator foyer. 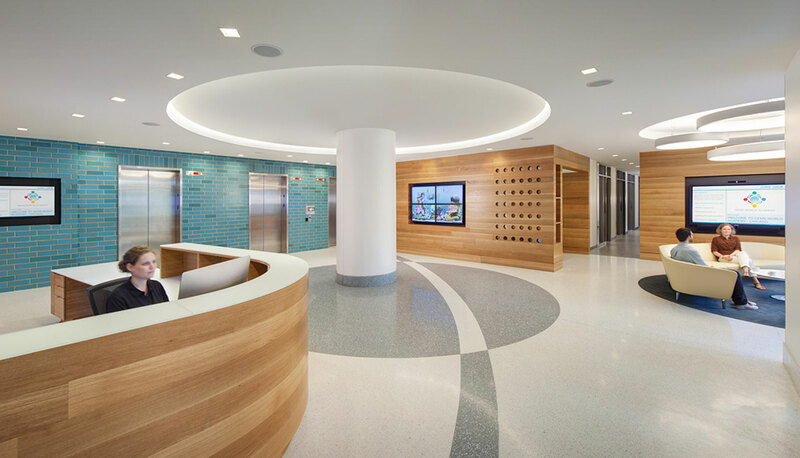 Honoring its name, references to pop art are seen throughout the building, while furnishings are contemporary and bright. 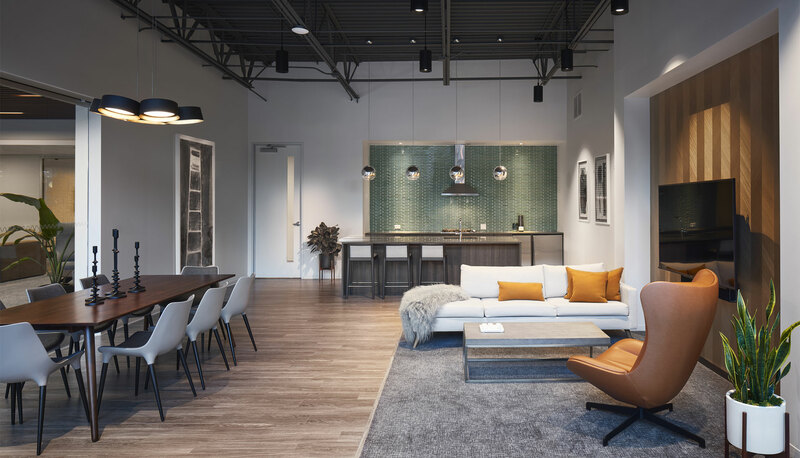 A unique amenity at The Gallery on Wells is a coffee shop proposed to be in the main residential entry. 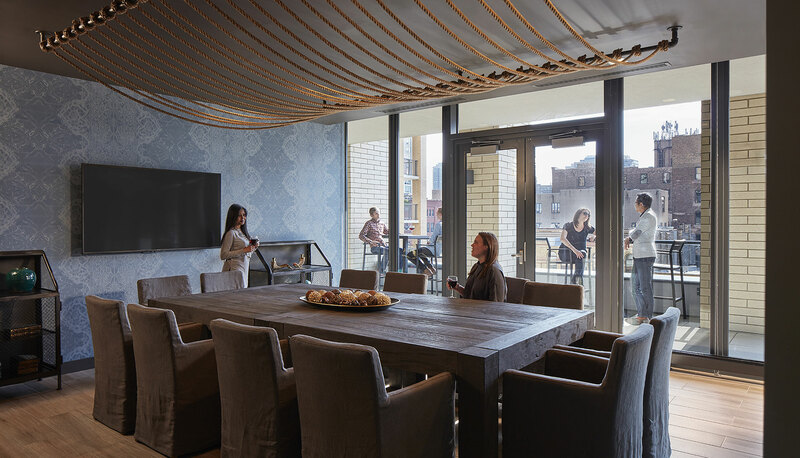 The client envisioned a fluidity between the residential lobby and the coffee shop to result in a casual yet sophisticated interior space. 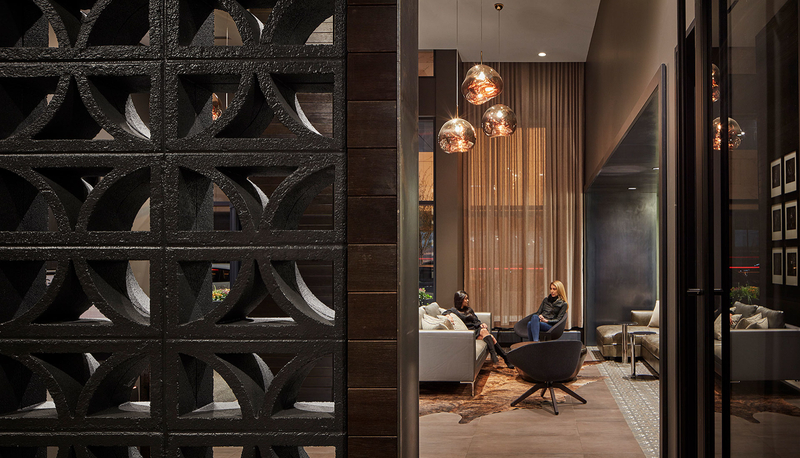 To retain the formality of a residential entrance, the bKL design team introduced a concept to distinguish a transition between the spaces: a large entry portal of blackened steel, heavy velvet drapery and decorative floor tile, which now creates a marked hospitality niche. 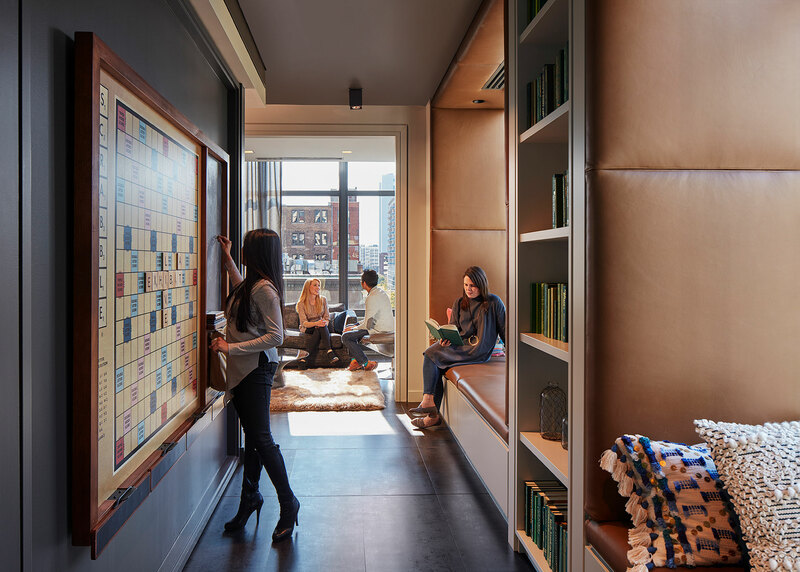 Residential amenities include an entertaining lounge with kitchen, living area, private study rooms, and a library space. 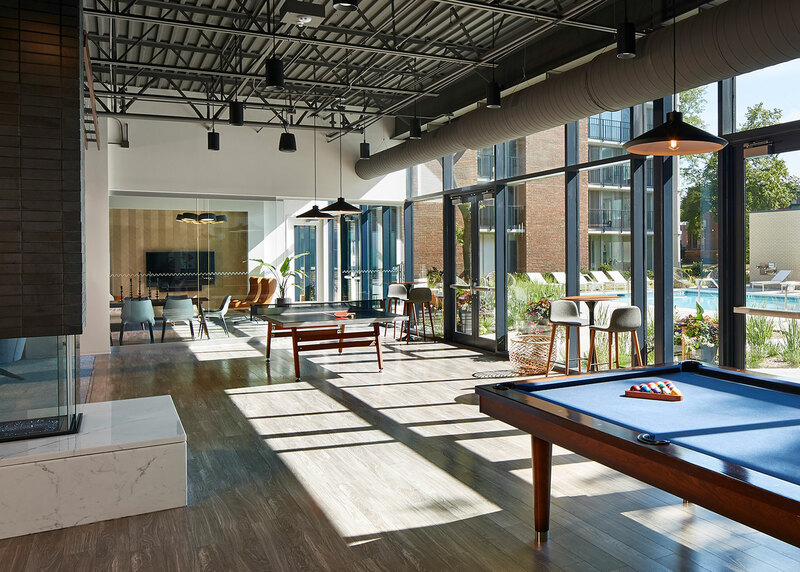 Additional amenities include a roof deck, outdoor lap pool, fitness center and various lounge rooms, including a game room. 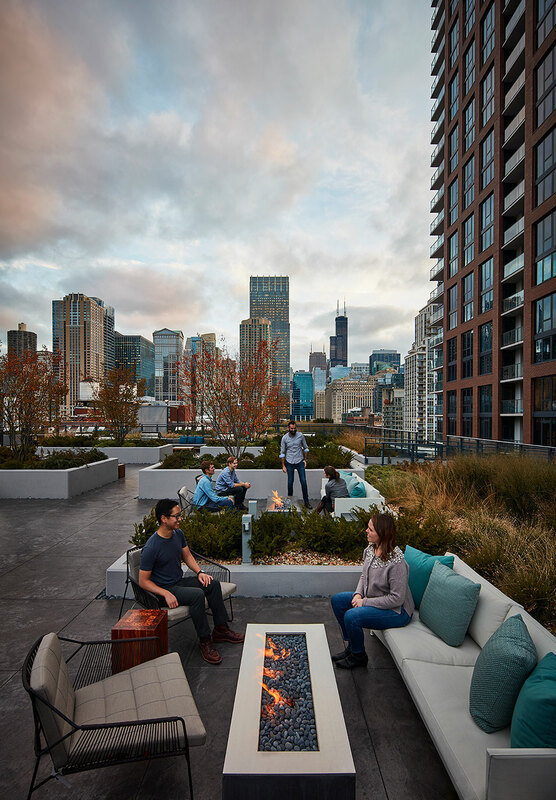 Located between the University Village, Little Italy and Illinois Medical District neighborhoods of Chicago, SCIO at the Medical District contains two 12-story buildings, each comprised of 205 residential units connected by a small entry pavilion with management offices. 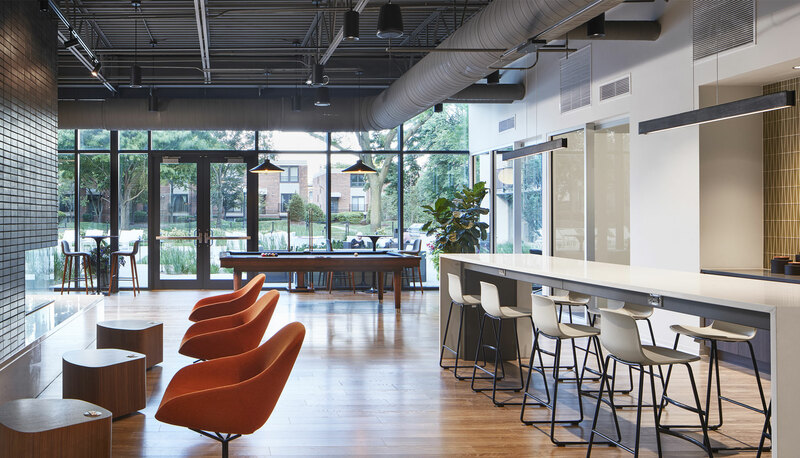 bKL designed the interior renovation of the two existing buildings and enlarged the central pavilion with a simple glass modernist enclosure, integrating the fabric of the existing buildings with the new mid-century modern inspired interior design. 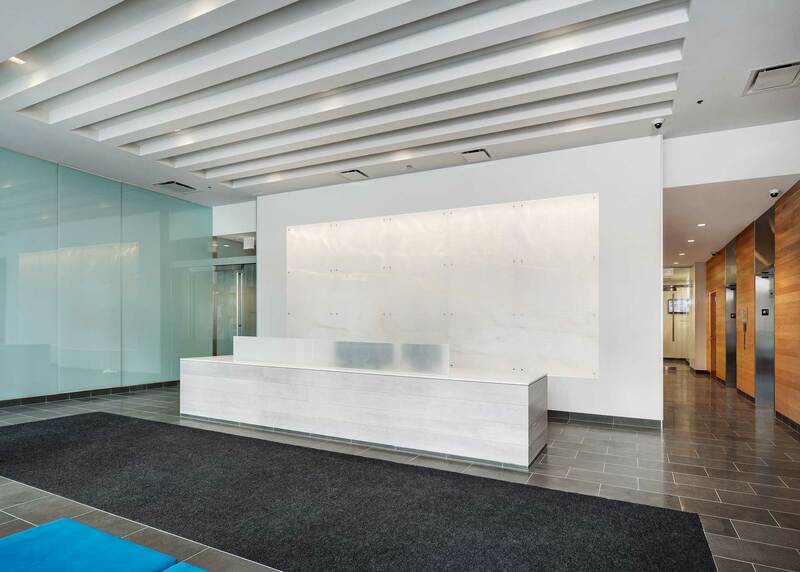 The new 7,800 square foot amenity building is comprised of a new entrance lobby, a management and leasing office, a gym, study rooms, indoor lounge and gaming space. 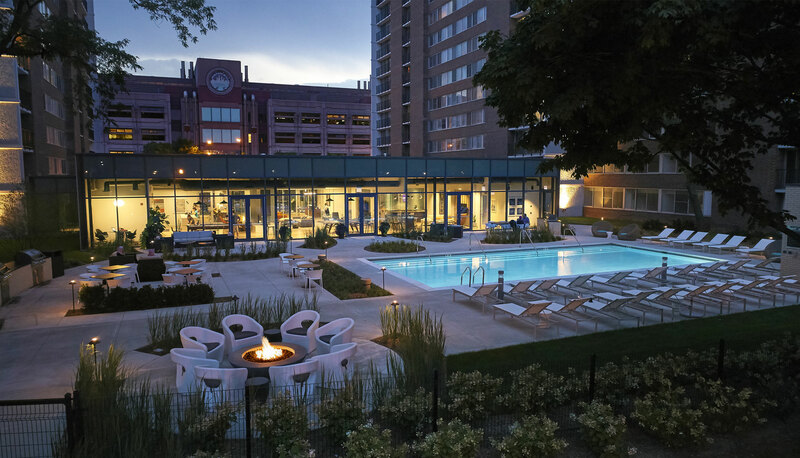 The outdoor amenity space includes a new pool, lounge area and barbecue grill stations. 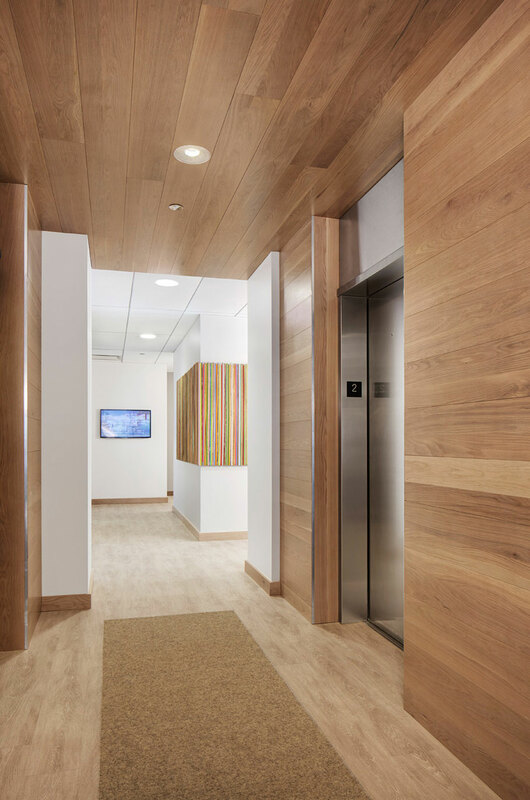 bKL additionally provided interior design services to renovate the residential corridors and apartment unit finishes. 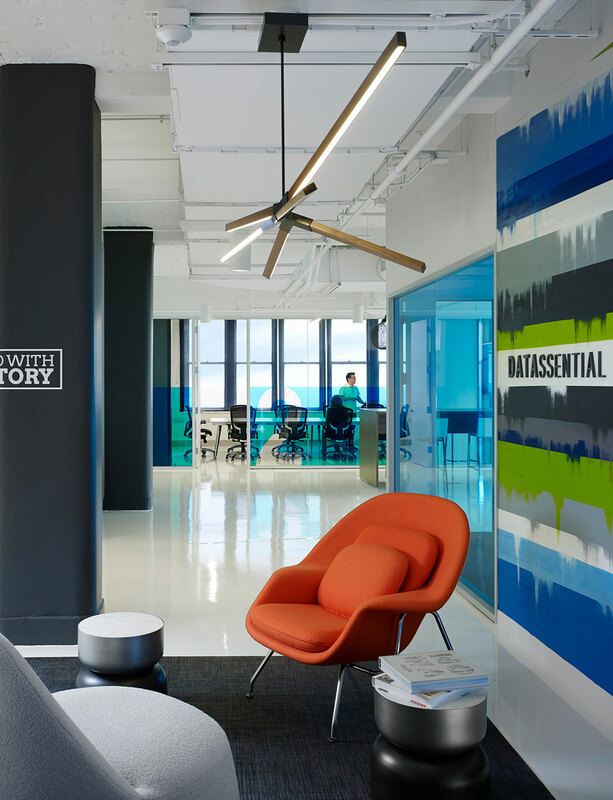 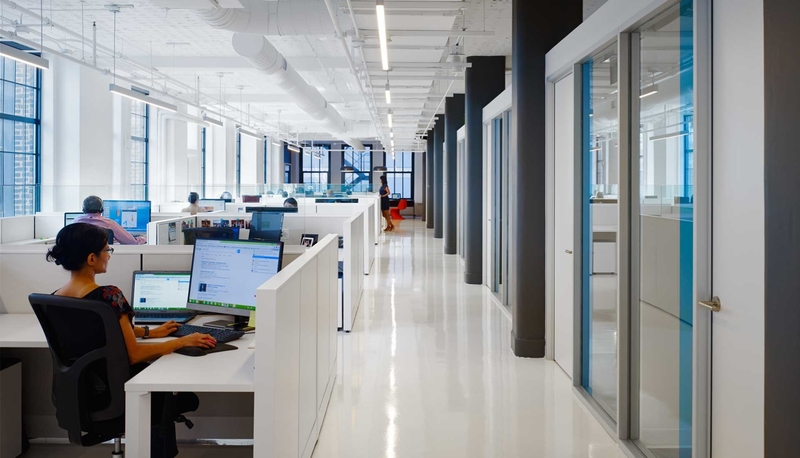 Datassential, a digital market research firm for the food industry, hired bKL to design their new offices in Chicago, Illinois. 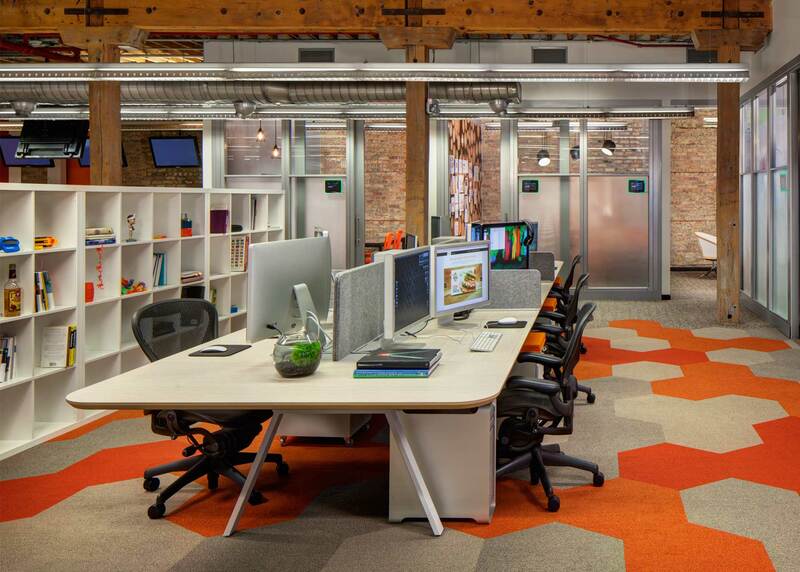 Previously housed in a sublet office space, this growing firm sought to create their new offices within the historic Gage Building on Michigan Avenue. 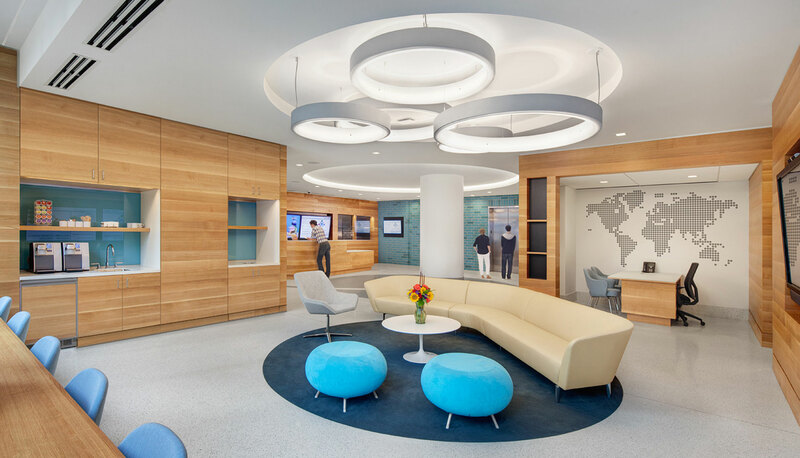 The client wished to create an energetic and progressive work environment that fostered improved staff collaboration and conveyed the technology driven brand of this growing company. 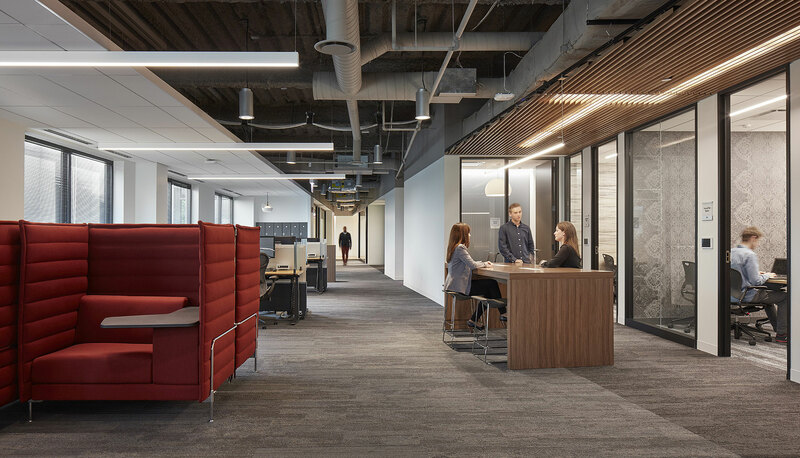 The design team set out to develop a flexible space plan that optimized the access to views of the city and lakefront, and promotes collaboration and long term flexibility. 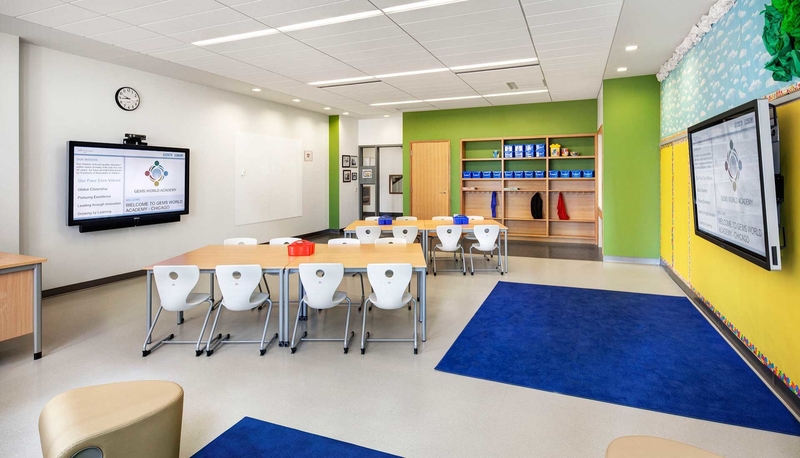 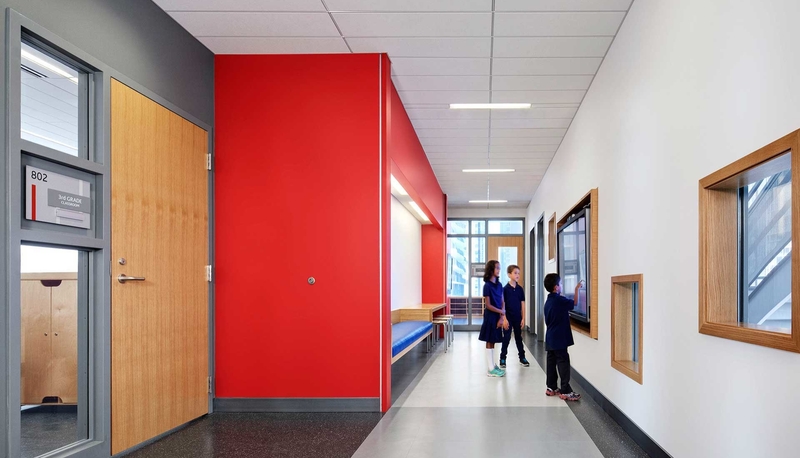 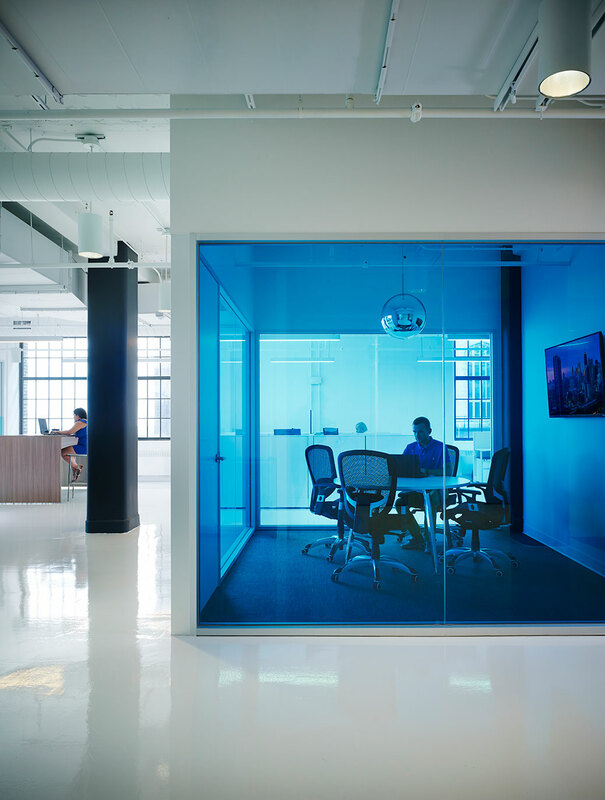 Modular planning strategies, highly reflective finishes, colored glass panels and clean architectural lines create an atmosphere that is young, energetic and professional. 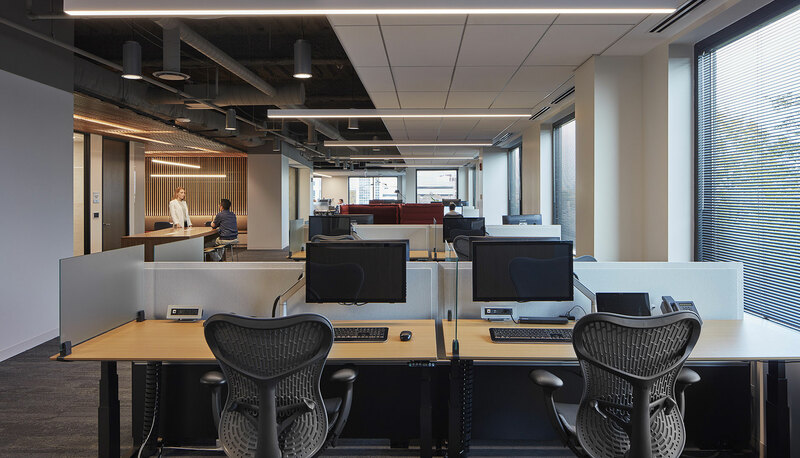 The team worked closely with the general contractor and furniture dealer to develop a cost conscious and efficient solution that can adapt as this rapidly changing business evolves. 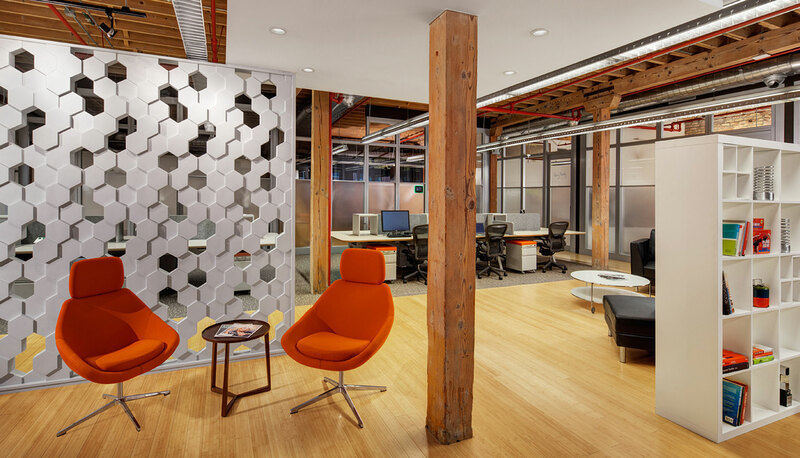 bKL provided interior design services for this rapidly growing marketing agency as it relocated from suburban offices to establish its headquarters in the River North neighborhood in Chicago. 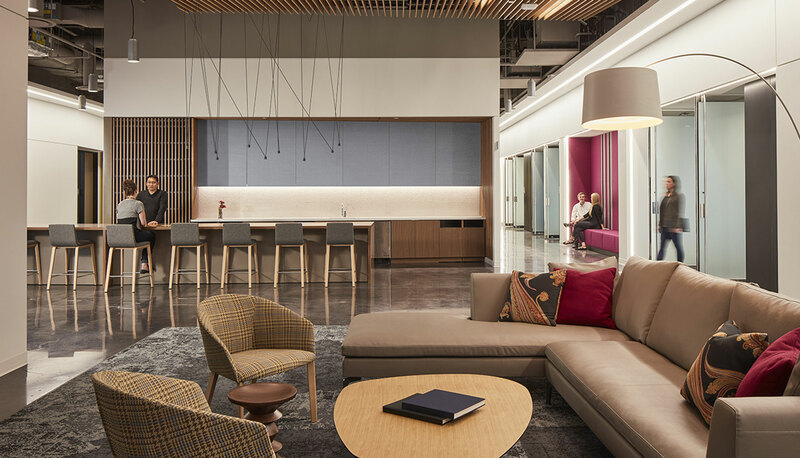 Choosing a stand-alone loft building to occupy, Fusion92 challenged the bKL design team to create a transformative work environment that fosters increased collaboration as well as privacy for spirited discussions. 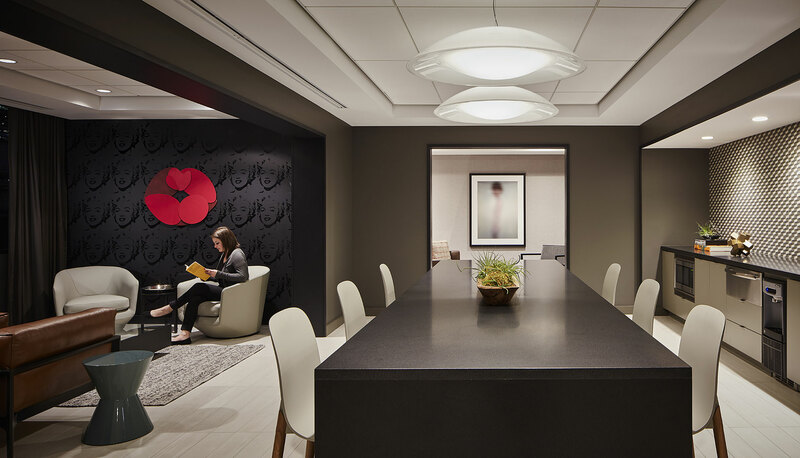 A paramount goal for the leadership of this agency is an environment that conveys the firm’s values, brand and culture. 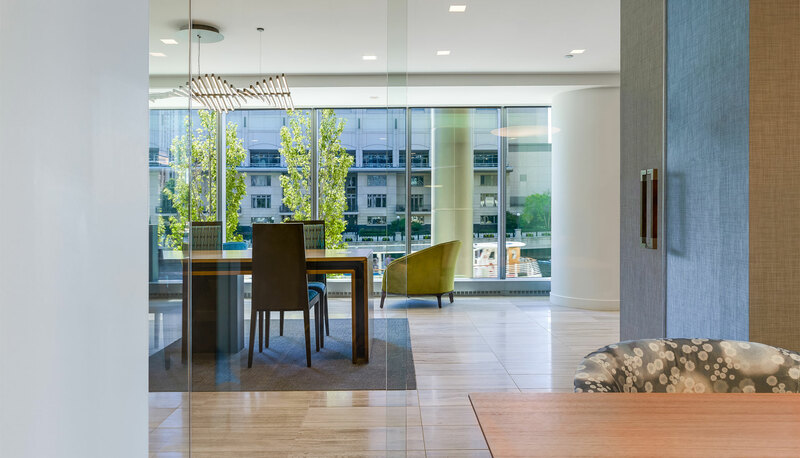 The bright open work spaces provide direct access to natural light and views of the city. 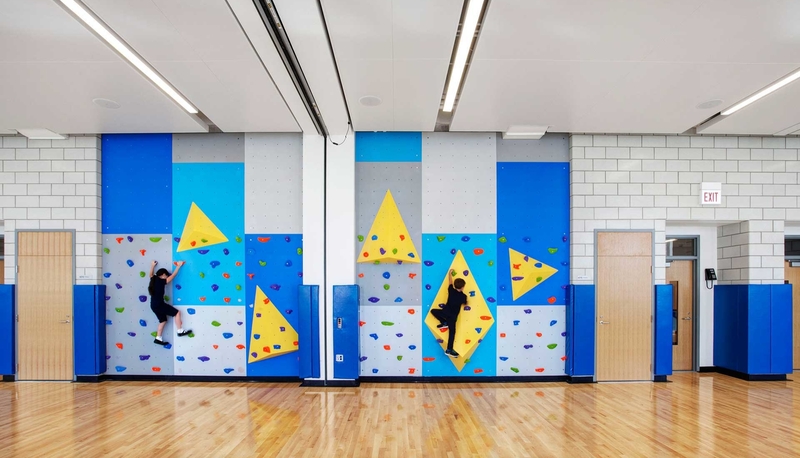 They are surrounded by themed, private workrooms for more focused activities. 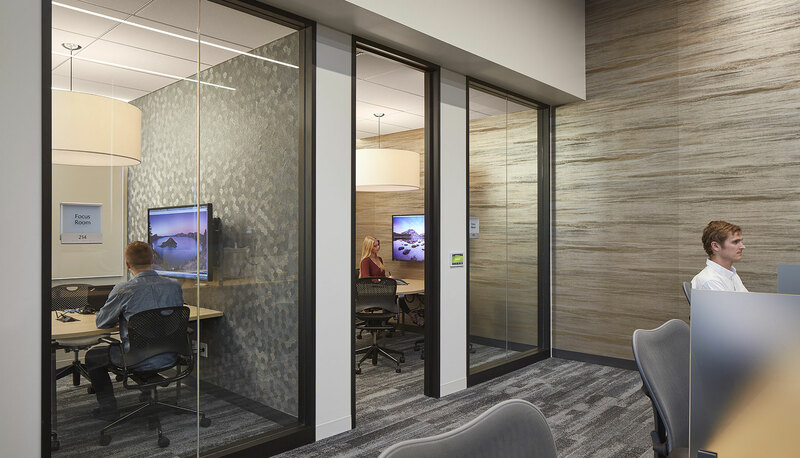 Each workroom is outfitted with the latest technology and collaboration tools to ensure seamless workflow for individuals and teams. 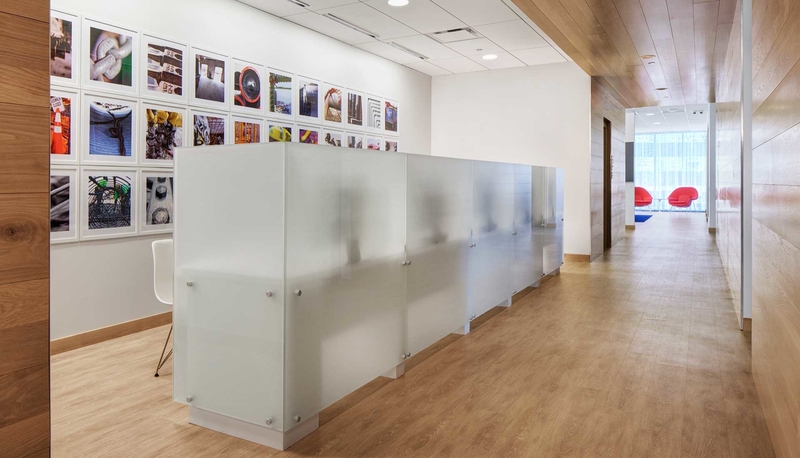 The lower level of this facility is comprised of a sound stage, audio recording booth and technology workrooms for the development of interactive marketing content for Fusion92’s innovative client base. 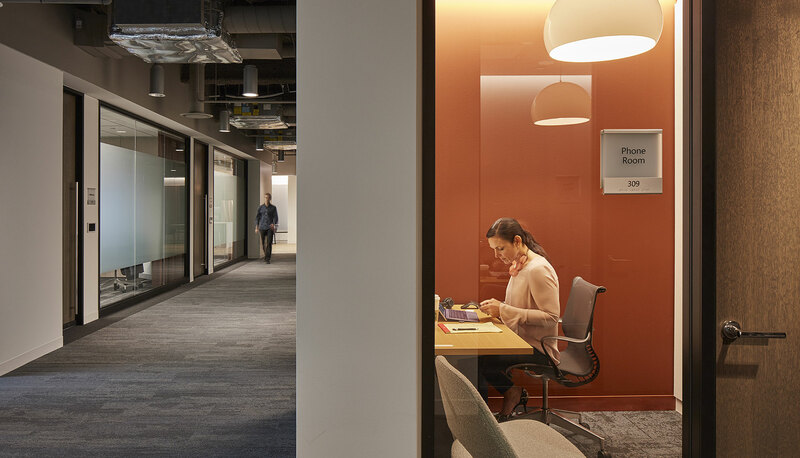 The result is an environment that reinforces the relaxed, playful brand and culture of this agency while providing employees with the tools and spaces to create their best work. 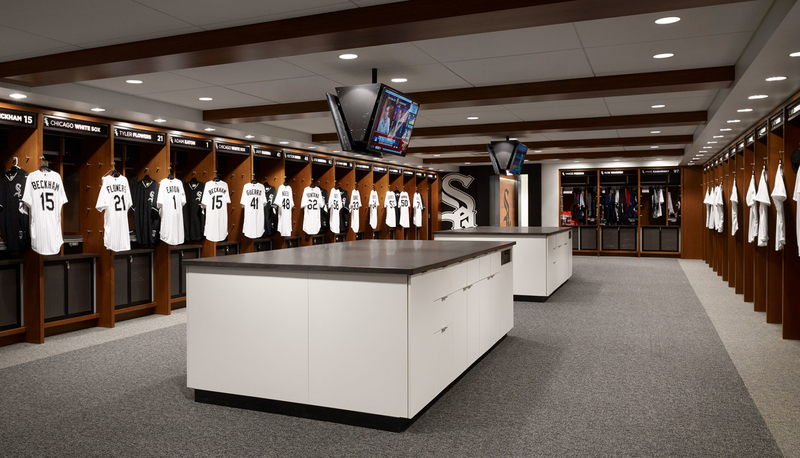 The Chicago White Sox sought to renovate their outdated Player’s Clubhouse at US Cellular Field in Chicago, Illinois. 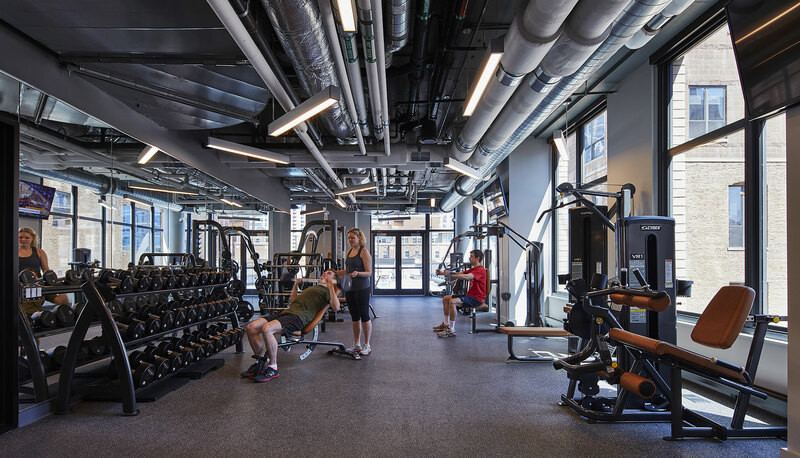 The bKL team worked closely with the design team at 360 Architecture (now HOK Sports) to create an updated facility that reflects this major league baseball organization, comprised of a player and coach’s locker room, player’s lounge, fitness facility and outfield maintenance facility. 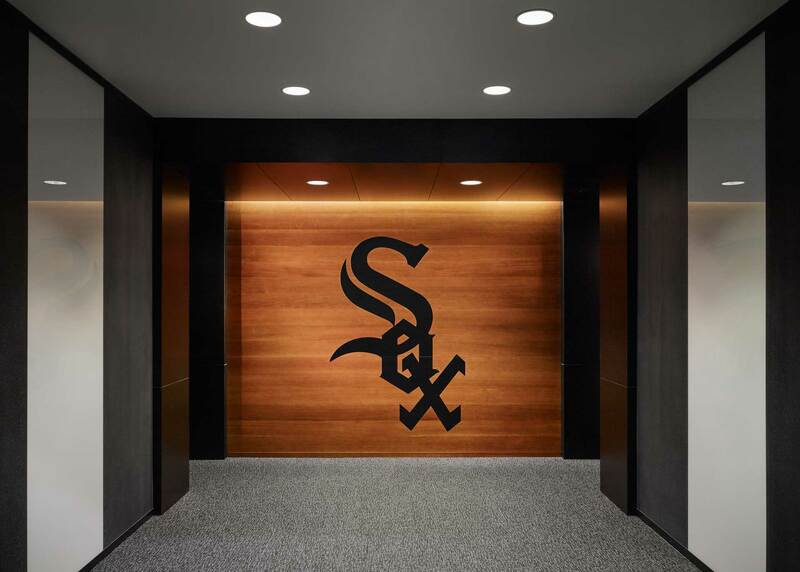 A new entry corridor was created to reinforce the team brand and provide a more formal entry that leads into the suite. 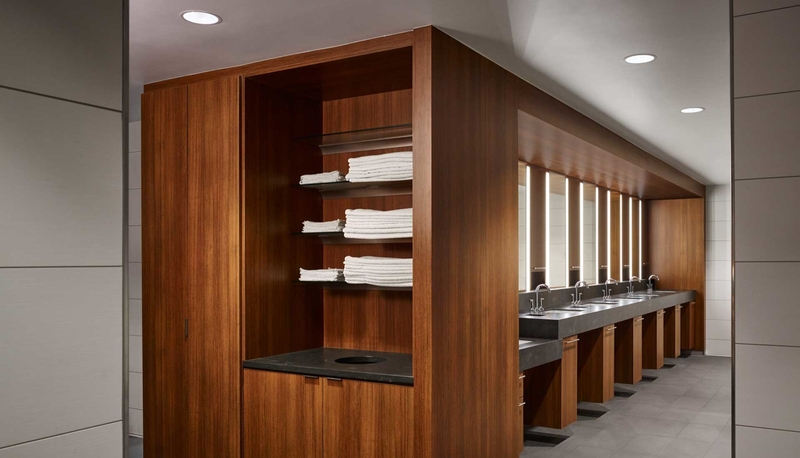 The player and coach’s locker rooms were reimagined, incorporating new custom millwork which accommodates the individual storage and equipment. 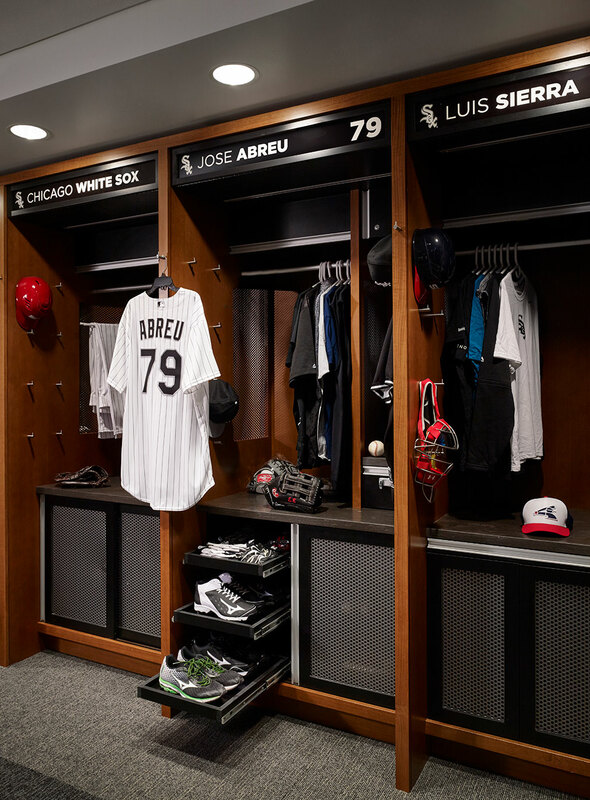 Updated technology and audio visual provisions allow players and coaches to keep track of events on the field and within the league. 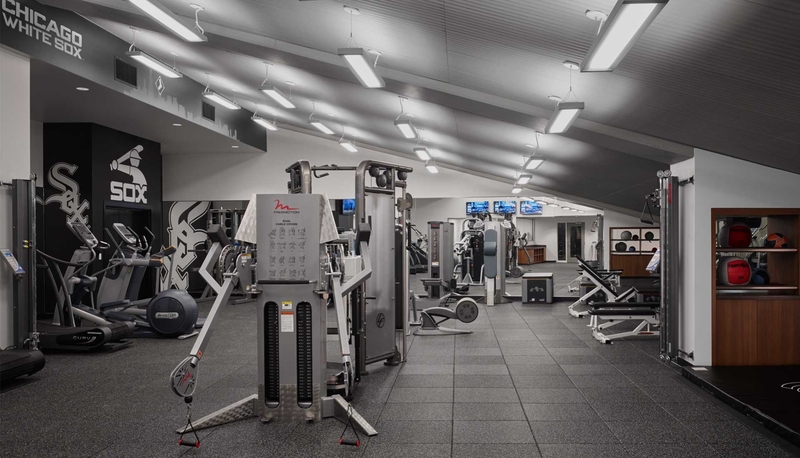 Updated shower, dressing and laundry facilities, a new fitness, hydrotherapy and training area provide players and coaches a current and hotel like experience. 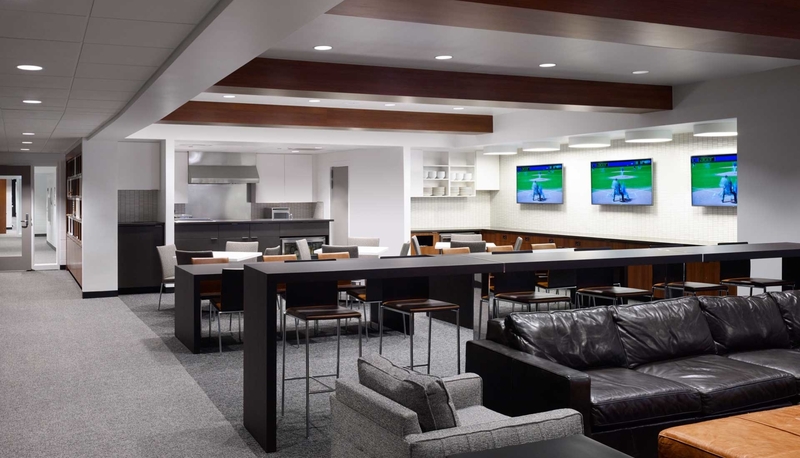 A full service kitchen and lounge complete the pre and post-game experience. 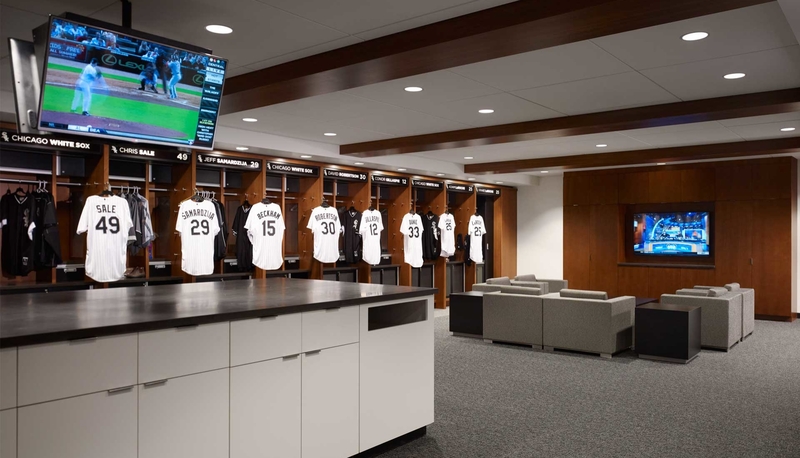 Due to the expansion of the player and coach facility, the design team was also required to relocate the maintenance staff area to a new addition in the outfield. 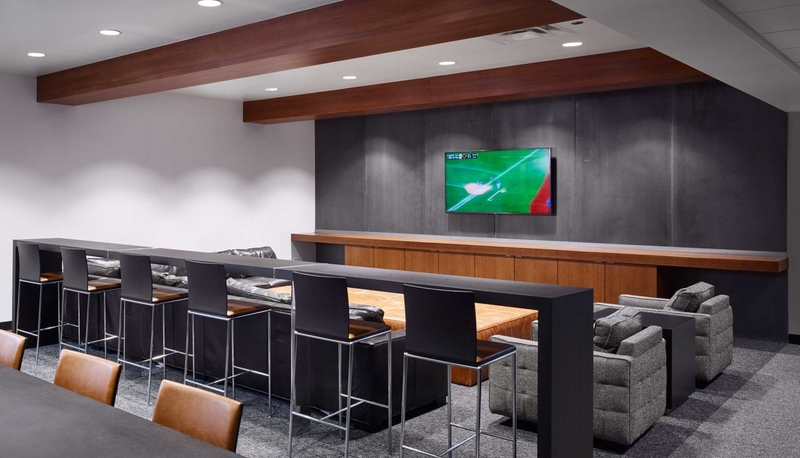 The result of our collaboration with 360 Architecture is an environment that provides players and coaches with an updated facility that supports the needs of this organization well into the future with style and sophistication.